Lazarus wrote: When's the next transit? May of 2019, according to that first video. 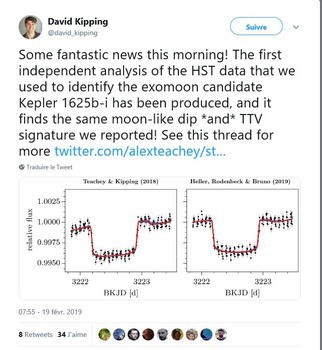 Teachey and Kipping’s transit data was gathered from Hubble observation during the October 29, 2017 transit of Kepler-1625b, and the latest transit of this planet just happened three weeks ago. Unfortunately, they did not schedule an observation for the latest transit but for the next transit on May 26, 2019. Considering the time of data processing, interpreting, writing, editing, peer-review, and publishing, the existence of Kepler-1625b-i will not be confirmed/discarded until the second half of 2020. Nevertheless orbital period and parameters reported in EPE link are wrong. Latest research paper provides a 22-24 days period for the exomoon and orbital distance around 40 planet radii, i.e. around 0.019 or 0.033 AUs assuming a 10 MJup planetary host. Then again, most exoplanet catalogues aren't even set up to be able to represent binary and multiple stars in a reasonable manner and planets have been known in such systems for quite a while now. Right? Maybe if more people were open to including the Solar System (should our planets count any less as planets? ), this problem could have been avoided. Edasich wrote: Nevertheless orbital period and parameters reported in EPE link are wrong. Latest research paper provides a 22-24 days period for the exomoon and orbital distance around 40 planet radii, i.e. around 0.019 or 0.033 AUs assuming a 10 MJup planetary host. I think what they're doing is keeping the star-centric orbit for the moon, giving it literally the planet's orbit. Hubble and @NASAKepler have found evidence of a potential exomoon! Join Hubble scientists live Friday, October 5th at 1 p.m. ET as they answer your questions about what this evidence could mean for the future of exploring new worlds outside our solar system. Use #AskNASA. Now on arXiv, along with a paper about the habitability of moons around this planet. Sirius_Alpha wrote: Now on arXiv, along with a paper about the habitability of moons around this planet. I'm highly skeptical of such a claim. Kepler-1625 b-i is likely tidally locked to its planet, making any orbits of such "moon-moons" below the synchronous orbit distance. Tides should work to lower the moon-moon's orbit until it merges with Kepler-1625b-i. This would be especially true if the moon-moon had a mass high enough to make it something more than a small Phobos-like rock. I preferred the term "subsatellite" or "submoon" for these hypothetical objects. I'm in agreement with Sirius_Alpha that the tidal evolution of the system needs to be taken into account, for example Kepler-1625b-i may have been closer to the planet in the past and migrated outwards, which would reduce the region of stability when the system formed. A paper about the topic from tonight's arXiv postings. Each of the giant planets within the Solar System has large moons but none of these moons have their own moons (which we call submoons). By analogy with studies of moons around short-period exoplanets, we investigate the dynamical stability of submoons. We find that 10 km-scale submoons can only survive around large (1000 km-scale) moons on wide-separation orbits. Tidal dissipation destabilizes the orbits of submoons around moons that are small or too close to their host planet; this is the case for most of the Solar System's moons. A handful of known moons are, however, capable of hosting long-lived submoons: Saturn's moons Titan and Iapetus, Jupiter's moon Callisto, and Earth's Moon. Based on its inferred mass and orbital separation, the newly-discovered exomoon candidate Kepler-1625b-I can, in principle, host submoons, although its large orbital inclination may pose a difficulty for dynamical stability. The existence, or lack thereof, of submoons, may yield important constraints on satellite formation and evolution in planetary systems. This is very unlikely there are any submoons elsewhere.There is discrepancy about star radius so we do not know for sure the moon is size of Neptune. Rings would be more tidally stable than moon-moons simply because rings don't raise an asymmetric tidal bulge on the moon to cause its orbit to drop. Gotta have missed this piece of news. Anyway considering massive orbiting bodies like the alleged ones in Kepler-1625 system moon-submoon systems don't seem much unrealistic, especially at large separations close to Hill's sphere outer boundary. There was a suggestion that the equatorial ridge on Iapetus might be the result of evolution involving a submoon and rings around the moons, e.g. this paper. There was a substantial revision of the stellar parameters from Kepler DR24 to DR25 but this got confirmed with the Gaia DR2 results, no? The (yet-to-be confirmed) discovery of a Neptune-sized moon around the 17.2 Jupiter-mass planet in Kepler 1625 puts interesting constraints on the formation of the system. In particular, the relatively wide orbit of the moon around the planet, at ~40 planetary radii, is hard to reconcile with planet formation theories. We demonstrate that the observed characteristics of the system can be explained from the tidal capture of a secondary planet in the young system. After a quick phase of tidal circularization, the lunar orbit, initially much tighter than 40 planetary radii, subsequently widened gradually due to tidal synchronization of the spin of the planet with the orbit, resulting in a synchronous planet-moon system. Interestingly, in our scenario the captured object was originally a Neptune-like planet, turned into a moon by its capture. David Kipping has posted about this on Twitter. It's not entirely clear why they are using such a high value for the planetary mass. A Neptune-sized exomoon candidate was recently announced by Teachey & Kipping (2018), orbiting a 287-day gas giant in the Kepler-1625 system. However, the system is poorly characterized and needs more observations to be confirmed, with the next potential transit in May 2019. In this paper, we aid observational follow-up by analyzing the transit signature of exomoons. We derive a simple analytic equation for the transit probability and use it to demonstrate how exomoons may frequently avoid transit if their orbit is larger than the stellar radius and sufficiently misaligned. The nominal orbit for the moon in Kepler-1625 has both of these characteristics, and we calculate that it may only transit approximately 40% of the time. This means that about 6 non-transits would be required to rule out the moon's existence at 95% confidence. When an exomoon's impact parameter is displaced off the star, the planet's impact parameter is displaced the other way, so larger planet transit durations are typically positively correlated with missed exomoon transits. On the other hand, strong correlations do not exist between missed exomoon transits and transit timing variations of the planet. We also show that nodal precession does not change an exomoon's transit probability and that it can break a prograde-retrograde degeneracy. Observations of the Kepler-1625 system with the Kepler and Hubble Space Telescopes have suggested the presence of a candidate exomoon, Kepler-1625b I, a Neptune-radius satellite orbiting a long-period Jovian planet. Here we present a new analysis of the Hubble observations, using an independent data reduction pipeline. We find that the transit light curve is well fit with a planet-only model, with a best-fit χ2ν equal to 1.01. The addition of a moon does not significantly improve the fit quality. We compare our results directly with the original light curve from Teachey & Kipping (2018), and find that we obtain a better fit to the data using a model with fewer free parameters (no moon). We discuss possible sources for the discrepancy in our results, and conclude that the lunar transit signal found by Teachey & Kipping (2018) was likely an artifact of the data reduction. This finding highlights the need to develop independent pipelines to confirm results that push the limits of measurement precision.